For those of us who have tried everything to help our four-legged friends get over various anxiety-related issues there’s a new product on the market called Thundershirt™ and it’s benefitting a lot of anxious dogs! As a professional pet sitting company, we oftentimes work with dogs who are not good candidates for boarding, including dogs who suffer from environmentally induced anxiety or fear. The Thundershirt™ is a product designed to help reduce anxiety in dogs. Whether your dog’s reactivity is due to abandonment issues or environmental sounds like thunder, vacuum cleaners or fireworks, Thundershirt™ can help reduce your dog’s stress. 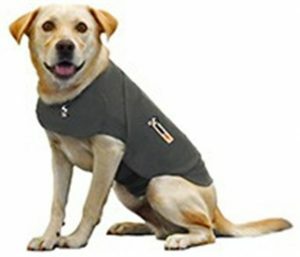 Thundershirt™ boasts an 80% success- rate and has a money-back guarantee. Not only have we experienced success with Thundershirt™ but our colleagues in the pet sitting industry have as well. The Shirt works by placing pressure on the dog’s body, which is believed by some experts to release a comforting hormone, thereby calming the dog – much like wrapping a baby up in a tight blanket! According to Thundershirt,™ it has an instant calming effect and is like a giant, wearable hug. Poochy Doos, LLC has recommended and used Thundershirt™ on our own dogs and highly recommend it for scaredy-cat dogs. You can check out this cool new product by visiting their website today. Need help with your anxious dog? Contact us today and learn about our pet sitting and dog walking service. We’d love to be your best friend’s friend!